Have you watched “You’re Beautiful”, the most popular K-drama on year 2009? Who among you fell in love with CNBLUE’s leader Jung Yonghwa’s character Shinwoo? Didn’t you wish he’d end up with Go Mi Nyu (or Go Mi Nam) played by Park Shin Hye? Raise your hands if you want to see them as couple in a drama. Well, MBC made your dreams come true! For this year 2011, they’ve brought back Yonghwa and Shinhye as a couple in the currently airing drama “Heartstrings”. Also, CNBLUE’s drummer Kang Minhyuk is part of the cast as the leader of the make-believe band “The Stupid”. Are you watching this drama too? 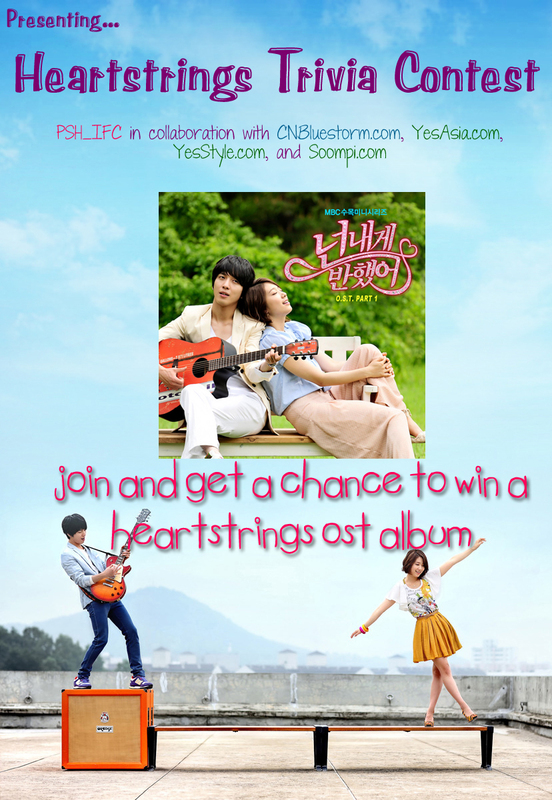 If not, start watching “Heartstrings” drama now and join this contest and get a chance to win a Heartstrings OST album! A question about the “Heartstrings” drama’s recent or previous episode will be given weekly until its last episode aired. “Heartstrings” drama is said to have 16 episodes. As of this post is published, it already aired 7 episodes. Thus, there are 9 episodes left, which means a total of 5 questions will be given and this contest will run in 5 weeks unless MBC decides to extend the drama. Answer the “Question of the Week (QOW)” which will be posted at the official “Heartstrings” soompi thread by heartstrings_2011 anytime every Monday, Pacific Standard Time (PST). Deadline for submission of answers will be every Wednesday at 1 PM PST. Each participant can submit an answer only ONCE per QOW. In the event where multiple entries received, only the first submission would be accepted. By submitting an answer for the QOW, you agree to the terms and conditions stated below. The first 3 participants who are able to give the correct answer will gain 1 point each. Soompi account name of those participants who gain point(s) will be posted weekly along with the QOW at the official “Heartstrings” soompi thread. Three (3) participants who will gain the highest point will be declared as the winners. In the event where some participants (more than 3) have the same highest points, the 3 winners will be selected randomly among those participants who have the same highest points. To enter the contest, participants must email the answer of the QOW with their real name, twitter ID and soompi account name with link to your soompi profile to heartstrings2011@yahoo.com before the deadline. Each participant can only submit an answer once per QOW. In the event where multiple entries received, only the first submission would be accepted. Participants should not create multiple accounts to enter the contest. If anyone is found doing so, he/she will be automatically eliminated from the contest. The contest period is from July 25, 2011 to August 25, 2011, Pacific Standard Time (PST). Anyone may participate. Even if you have failed to submit an answer of the preceding QOW. Links to the given or previous “Questions of the Week (QOW)” will be posted and updated at this page. So stay tune! Participants who gain point(s) will be posted weekly along with the QOW at this page and at the official “Heartstrings” soompi thread. You might be one of them, so stay tune! The soompi account name of the winners will be posted in this page and at the official “Heartstrings” soompi thread on August 31, 2011 unless the drama gets extended. In the case where MBC extends the episodes of “Heartstrings” drama, additional QOW will be given thus this contest will also be extended. The date when the winners will be announced will be changed without prior notice. So, please visit this post always. The 3 winners will receive one (1) Heartstrings OST album each, as a prize. As of the time this post is published, MBC already released Heartstrings OST Part 1. There might be Part 2 or Part 3 and so on. Thus, we will be giving out any “Part” of the “Heartstrings OST album depending on its availability of stock. The announcement of the winners is final and we will not entertain any follow-up emails or questions regarding the winners. We reserve the right to change the terms and conditions without prior notice. is there a link to Question #2 please..
when are you going to post the 2nd question?